Airbus Defence and Space has followed its earlier achievement in demonstrating Automatic Air-to-Air (A3R) Refuelling of a fighter with another world-first - the same operation performed with a Large Receiver Aircraft. In a Joint Operation with the Royal Australian Air Force (RAAF), which is collaborating with Airbus in development of this pioneering technology, Airbus' A310 company Development Tanker performed seven automatic contacts with a RAAF KC-30A Multi-Role Tanker Transport (MRTT), also made by Airbus. The system requires no additional equipment on the receiver and is intended to reduce Refuelling Boom operator workload, improve safety, and optimise the rate of Air-to-Air Refuelling (AAR) in operational conditions to maximise aerial superiority. Airbus has begun work towards introducing the system on the current production A330 Multi-Role Tanker Transport (A330 MRTT). During initial approach of the Receiver, Boom Control is performed by the Tanker's Air Refuelling Operator (ARO) as usual. Innovative passive techniques such as Image Processing are then used to determine the receiver's refuelling receptacle position and when the automated system is activated, a Fully Automated Flight Control System flies and maintains the boom aligned with the receiver's receptacle. The Telescopic Beam inside the boom can be controlled in a range of ways including: manually by the ARO; a relative distance-keeping mode; or full Auto-Mode to perform the contact. In the 20th June flight off the southern Spanish Coast, the A310 Tanker performed the scheduled seven contacts over a two-hour test period. David Piatti, who again acted as Airbus Test ARO, or "Boomer", on the A310, said: "It was extremely impressive to see how accurately the A3R System tracks the receiver. It can be very useful to be able to refuel another tanker or transport, for example to extend its deployment range or to avoid taking fuel back to base, but it is also a challenging operation and this system has the potential to reduce workload and the risk involved." The trial was conducted in conjunction with Test Pilots and Flight Test Engineers from the RAAF's Aircraft Research and Development Unit (ARDU). Squadron Leader Lawry Benier, Executive Officer for ARDU, said the RAAF were assisting Airbus Defence & Space on the development of A3R and other technologies to increase the utility of the KC-30A within a battlespace. "It's very encouraging to come to Spain and see the progress that's been made with A3R, and be able to witness it first-hand refuelling our KC-30A," Squadron Leader Benier said. "Refuelling Large Receivers is a role RAAF has conducted extensively on operations and exercises, allowing us to extend the reach and responsiveness of our Air Mobility Fleet, as well as keep Surveillance Aircraft in the air for longer." 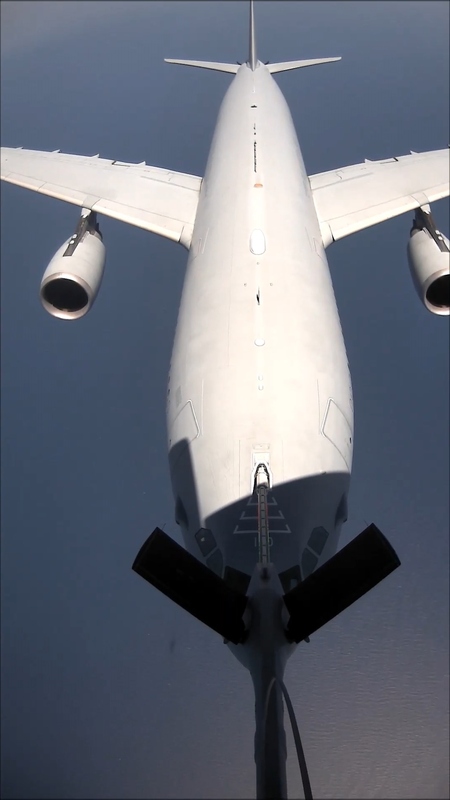 The photos show the first automatic contact between the A310 MRTT Demonstrator and the KC-30A, and an emulation of what the Image Processing System "sees".